Members of a resistance organization in the camp meet with American soldiers in front of the entrance to the Buchenwald concentration camp. Buchenwald, Germany, after April 11, 1945. 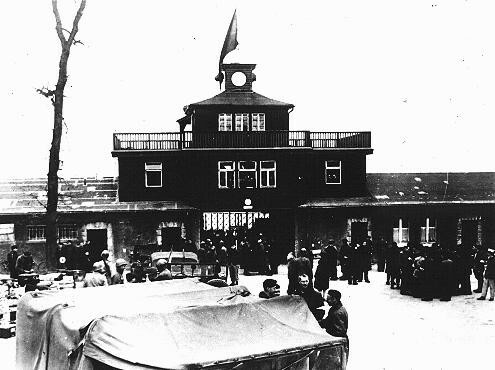 In early April 1945, as US forces approached the camp, the Germans began to evacuate some 28,000 prisoners from the main camp and an additional several thousand prisoners from the subcamps of Buchenwald. About a third of these prisoners died from exhaustion en route or shortly after arrival, or were shot by the SS. The underground resistance organization in Buchenwald, whose members held key administrative posts in the camp, saved many lives. They obstructed Nazi orders and delayed the evacuation.